This ‘try-it-dive’ is not a course. It is a heavily attended dive by a dive instructor. 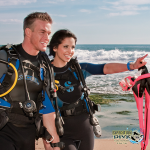 After trying discover scuba, you may upgrade to an open water course and receive a $100 savings applied if done within 6 months. Single dives take 2-3 hours in total inclusive of brief, gear up, dive and de-gear. Each dive last 40 min to 1 hour of underwater time per air consumption. 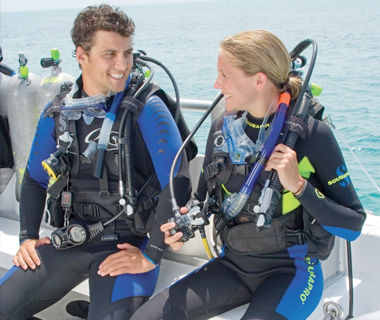 All dives guided by an experienced, fun n’ friendly dive master/ instructor. Free pick-ups/drop offs available at closest train station point to dive site or all locations accessible by bus / car within 30 minute drive from Sydney centre. Purchases and Gift Cards are non-refundable. 10-day notification required for cancellations/reschedules/no shows for full credit toward another dive. Additional reschedule fee’s may apply. Dives are subject to change if due to high winds / heavy storms at the discretion of guide or instructor on the day of dive unless notified prior. In such cases full credit will be issued on rescheduled dives. Have you always been curious about what life is like underwater? Would you like to learn to dive? If your answer is yes, then why not satisfy your curiosity by having a discover scuba diving experience? While it’s no certification course, it’s the perfect program for beginners as its main target is to introduce what diving is like to anybody who wants to have a taste of life under water. 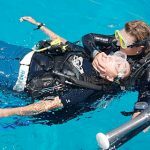 The best part of wanting to learn to dive is it’s offered in PADI dive shops with three possible locations: whether in a pool, at a certain beach or from a dive boat. It’s absolutely your choice if you want to have your first diving experience near your home or while exploring a diving destination. If you want to sign up for this program, you would know from the discover scuba diving briefing that you need not have any prior diving experience. You just have to be at least ten years of age and be in good physical health to learn to dive. So, what can you expect from discover scuba diving? Definitely a lot of exciting things. For starters, you’ll learn about the fundamental guidelines of the said outdoor activity. With the help of a discover scuba diving participant guide, you’ll know what skills are needed in order for you to have a successful dive. It’s interesting enough to learn what equipment you’ll be using, but just imagine how exciting it would be to be finally able to use them! Not only would have a taste of what it feels like to breathe underwater, you would probably be pleasantly surprised that it’s actually quite easy to swim wearing the standard scuba diving suit and gear. Of course, while undertaking this program, you’ll be under the supervision of a discover scuba diving leader who will make sure that you are doing all procedures the proper, and more importantly, safe way. Keep in mind that while diving is a really fun outdoor sport, you do need to be careful and conscious of what basic and standard rules to follow. 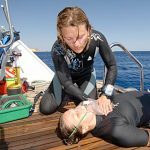 The effect of being able to dive vary but for some, it’s serves as a realization that they actually want to be certified. Now, this may take some time and effort, but don’t let this dishearten you. Every expert diver went through the same thing. The good news is you’re definitely on the right track with what discover scuba diving skills you will be learning. For you to have an even better idea of what discover scuba diving has to offer, you can check out online discover scuba diving videos and see for yourself what fascinating adventures await you under the depths of the sea. We abide by a strict 4 participant per 1 instructor ratio in our discover scuba programs to ensure the safety of our customers. While it is not an actual scuba certification, during the Discover Scuba Diving experience you’ll learn how to use scuba equipment in shallow water and get a quick and easy introduction to what it takes to explore the underwater world. During your Discover scuba diving experience, a highly trained and experience instructor will guide you every step of the way. There is nothing like breathing underwater for the very first time. It takes a little getting used to after all, human beings weren’t designed to do that – but after a few minutes of awestruck wonder, most participants realize how easy scuba diving really is! Imagine being weightless, gliding through the water, swimming with colourful coral and seeing life on this earth as you have never seen before. And The fun part…it’s all fun! Plus, you can get credit! If your Discover Scuba Diving program includes an actual scuba dive in open water, your experience can be applied to the 1st dive toward PADI Scuba Diver or Open Water Diver certification, putting you a step ahead of the game when you decide to go for it! Willingness to try something new! *considering Scuba Diving requires your consistent ability to be conscious under water at all times, certain medical conditions may prevent you from diving. If you have specific questions regarding this, don’t hesitate to contact us.